On an autumn evening, October third to be exact, in 1849, a middle-aged Edgar Allan Poe was found wandering the streets of Baltimore, Maryland in a delusional, hysterical state. Unkempt, dirty, with “vacant eyes” and in someone else’s clothes, the writer was admitted to Washington College Hospital unable to explain what had happened to him. At five am on October seventh, Edgar Allen Poe was pronounced dead. The cause of death has never been definitively identified, though theories have included cirrhosis of the liver, cholera, rabies, syphilis, influenza, and a victim of cooping (more on the cooping theory in the Bonus Facts below). Either way, after a small funeral, Edgar Allen Poe was laid to rest at Westminster Hall and Burying Ground in Baltimore. Beginning nearly 80 years after Poe’s death, in the 1930s, witnesses began seeing a shadowy figure, dressed in black with a white scarf and a wide-brimmed hat, visiting Poe’s grave every January 19th, the birthdate of the legendary literary figure. In the dead of night, the individual would arrive bearing three roses and a bottle of cognac. When the sun rose the next morning, the roses would be in a distinctive arrangement, the bottle of cognac would be half-drunk, and, sometimes, a note would be left sitting silently on the grave. This act of tribute was first mentioned in a 1950 Evening Sun (Baltimore’s evening newspaper) article as an effort to bring attention to the church for a restoration. Through the years, the public began to learn more about this dark figure. The three roses represented Poe, his tuberculosis-stricken and beloved wife Virginia, and his mother-in-law Maria Clemm — all three of whom were originally interred at the same site. 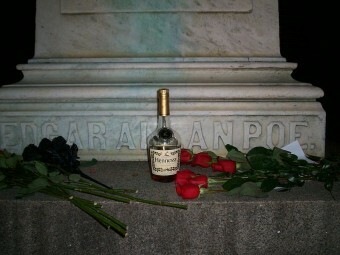 The bottle of cognac spoke to Poe’s long love of drink. As for the significance of cognac specifically, a 2004 note inferred that this was a tradition of the toaster’s family, rather than Poe himself. The notes that were left further shrouded this mystery. Sometimes the scribbles quoted Poe’s poems and stories. Sometimes they were simple words of devotion, like “Edgar, I haven’t forgotten you.” Other times, though, it cast a light on the person that was coming to visit every year. For instance, in 1993, the note cryptically mentioned that “a torch will be passed.” In 1999, another note indicated that the original toaster had passed and a “son” had been assigned this task. In 2001, merely days before the Baltimore Ravens (yes, named after the famous Poe poem) were to take on the New York Giants in the Super Bowl, the note left read “ “The New York Giants. Darkness and decay and the big blue hold dominion over all. The Baltimore Ravens. A thousand injuries they will suffer. Edgar Allan Poe evermore.” As a play on Poe’s “The Masque of Red Death,” the note seemed to indicate the beloved Baltimore football team would lose in the Super Bowl. This angered many Baltimoreans, but the prediction would not come true. The Ravens football team beat the New York Giants and won the Super Bowl by the score of 34 to 7. So who was behind this? Many think that the true identity lies somewhere with Jeff Jerome, the former curator of the Poe House and Museum in Baltimore. He himself has been a suspect, but Jerome has repeatedly denied it. Though, he admits he knows more about the identity of the real individual than anyone else. After becoming a tour guide at Westminster Hall in 1976, he began to do research on Poe’s final resting place. That’s where he found the 1950 press clipping and on January 20, 1977, he found the roses and cognac waiting in the cold morning light. That day, Jerome became enamored with the Poe Toaster legend. From that moment on, he and a few other Poe enthusiasts would sit in the church every January 19th waiting to catch a glimpse of the elusive figure. That all changed in 1990 when Life magazine published a black & white image of the Poe Toaster doing his deed. Soon, the Poe Toaster became an international sensation. In the years that followed, scores of people would wait outside of the cemetery gate hoping to see this figure. It also spawned countless imposters. But Jerome made it his mission to preserve this tradition and to make sure the real Poe Toaster could do his deed. He made it easier for him get into the cemetery without dealing with the crowds (probably by leaving open the Wineholt Gate, which, incidentally, was used to bring in Poe’s body). He arranged a string of subtle signs with the Toaster himself that would indicate that he was, in fact, the real one. This arrangement worked and allowed the tradition to be continued without interference. At least until 2009, the bicentennial of Poe’s birth. Leading up to the 160th anniversary of Poe’s demise, there were clues that the Poe Toaster tradition may be coming to a close. Starting in 1999, when the aforementioned new toaster took over the tradition, notes, like one referencing Baltimore’s football team and another one in 2004 criticizing France’s involvement in the Iraq War, seem to not take the tradition seriously. In fact, Jerome admitted that certain notes had so badly marred the original Toaster’s motives, that he has denied their existence. With over a hundred people in attendance in 2009, waiting for the Poe Toaster, it had officially become more of spectacle than both the Poe Toaster and Jerome would have liked. In 2010 and 2011, no toaster showed up (save for imposters) at Poe’s grave for the first time in least seventy years. In 2012, Jerome declared that if the real toaster did not show up that year, he would call the whole thing off and declare the tradition dead. No one came. With so many Poe fans and admirers around the world keeping an eager eye out, it is becoming exceedingly likely the tradition of the Poe Toaster may be nevermore. Who was the Real “Mother Goose”? Several historians believe that Edgar Allan Poe was a victim of cooping, a 19th century practice that went on with some frequency. Cooping was when an innocent bystander was kidnapped or coerced into voting for a certain candidate in different polling places. These “cooping gangs” would grab someone, force feed them alcohol or drugs (or find someone who was already inebriated) to ease compliance, and drag them to polling locations. Often, they would dress the kidnapped in different clothes or give them disguises to prevent them from being recognized. If the unsuspecting citizen didn’t go along with it, they would be beaten or, even killed. Poe was found delirious on election day at a tavern that doubled as a polling place wearing someone else’s clothes, hence the suspicion. For a long time, the Colts were Baltimore’s football team. But in the middle of the night in 1983, with a line of Mayflower moving vans being escorted out of town, the Baltimore Colts moved to Indianapolis. In 1996, though, it was ruled that Baltimore would get their football team back, with the Cleveland Browns moving to Maryland. In order to create their own history, the Baltimore football team needed a new nickname. Eventually, a list of hundred possible nicknames was wilted down to just three; the Americans, the Marauders, and in honor of Baltimore’s literary tradition, the Ravens. The Baltimore Sun conducted a telephone poll of readers and it was determined, by a nearly two-thirds margin, that the Ravens would be the new name. Now, wearing their uniforms of purple and black, Raven players watch during every home game as a real live raven flies high above the stadium and across the Baltimore sky, hoping to curse the opponent with touchdowns nevermore. In 2007, a 92-year-old man by the name of Sam Porpora claimed that he was the Poe Toaster. A former historian for the Westminster Church, he said that he invented the tradition as a publicity stunt in the 1960s to improve morale in the congregation. For awhile, Sam Porpora was considered the Poe Toaster, but Jerome had to remind people that there is physical evidence that this tradition started back to at least 1950, and according to many witnesses, back to the 1930s. Bicentennial is 200 years; 1849-2009 is 160 years, and thus a Sesquicentennial plus ten. You guys seriously need an good editor. Egg all over my face. I was counting from his death, not his birth. Whoops. Why van someone not pick up the tradition. Just because the original toaster(s) stopped doesn’t mean the act should. As long as an imposter had genuine intent (not self glory) but truly wanting to pay respects to Poe, why not let them carry out the tradition? ?